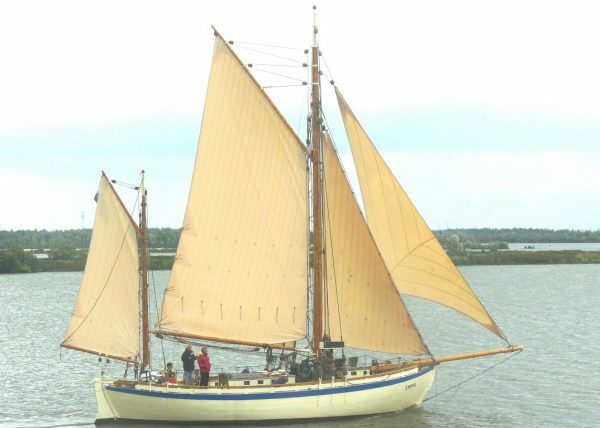 Colin Archer gaff ketch built to original plans and first launched in 2008 but completed in 2014. 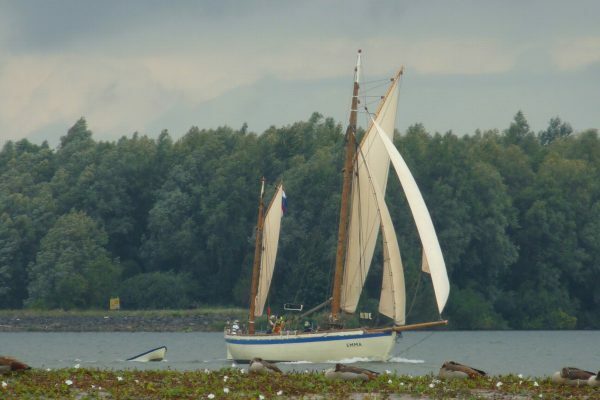 The result of many years hard work and perseverance by one man, Thomas Pollmann, from Holland. 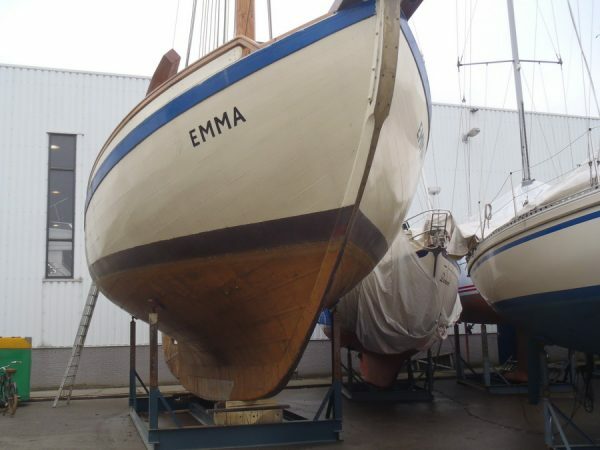 After laying down the keel in 1999 and with setbacks along the way, the boat was completed in 2014. 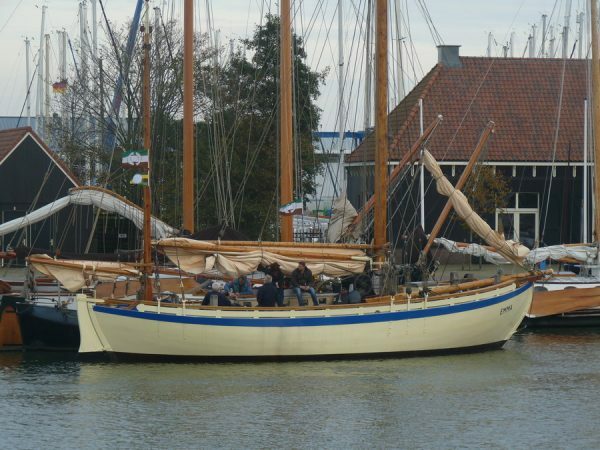 The materials used are second to none, the hull is planked entirely of oak with oak frames, all bronze fastened and with no ferrous metals in the construction of the hull and decks. 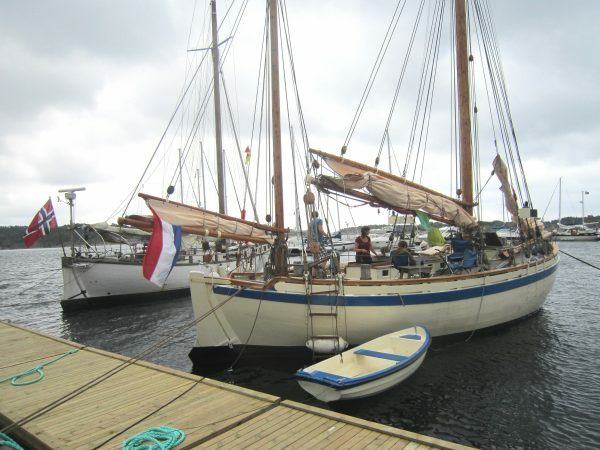 Mr Pollman felled each tree, cast the lead keel, made the spars and spliced the rigging himself. 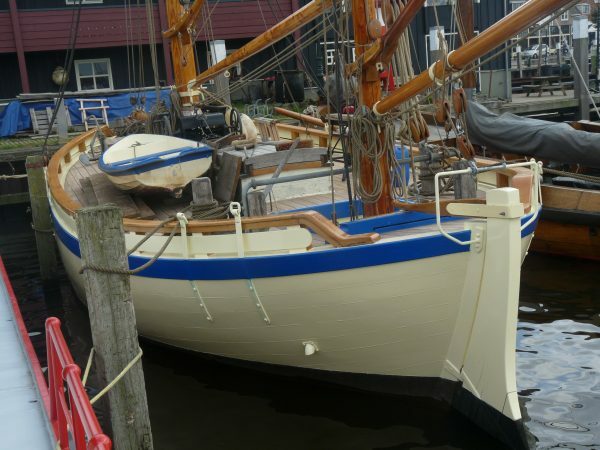 Unfortunately after many years in build he cannot use the boat for his original intended purpose and she must be sold. She has made several voyages including a trip to Norway and performed extremely well. 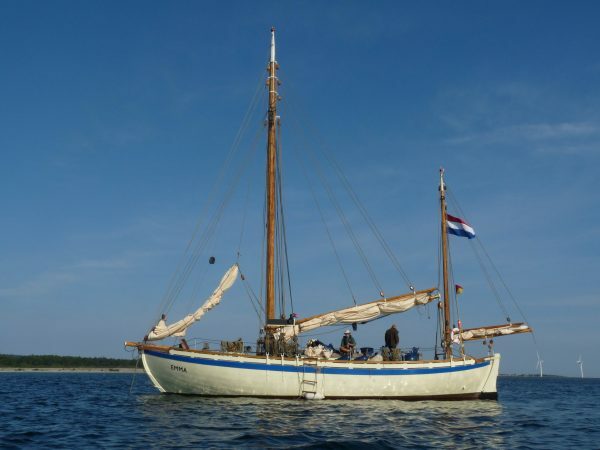 The boat is in commission and has everything required to sail, however the interior has been finished to a basic standard and a new owner will probably wish to improve the interior joinery. 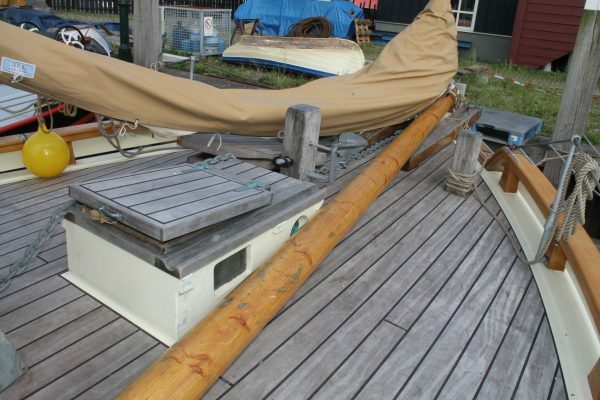 This is a unique opportunity to obtain a virtually new Colin Archer yacht, built to the highest standards, for what is very sensible money. 2014 survey available. Planked in oak all bronze screw fastened to laminated oak frames. Very heavy construction. All through bolts and fixings are bronze. 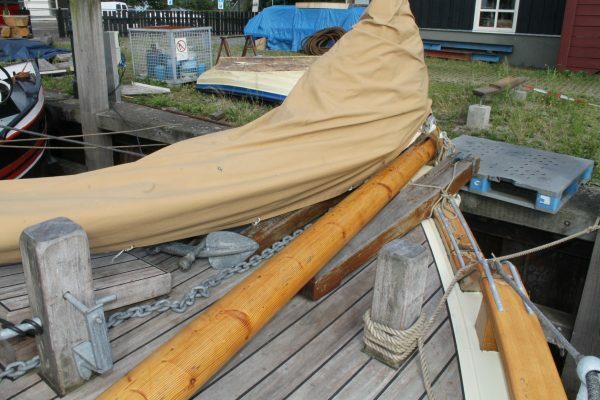 Copper sheathed below the waterline. 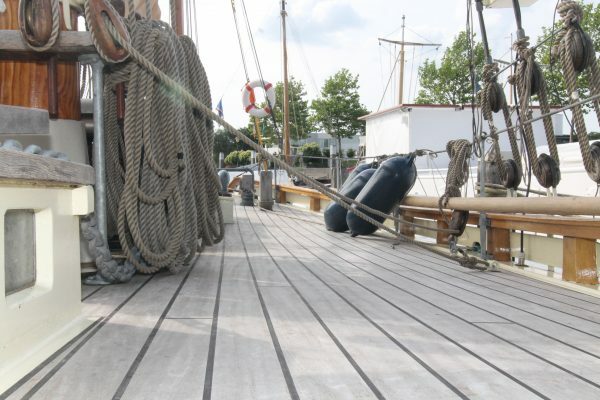 Straight laid solid deck in Afzelia, an African hardwood. 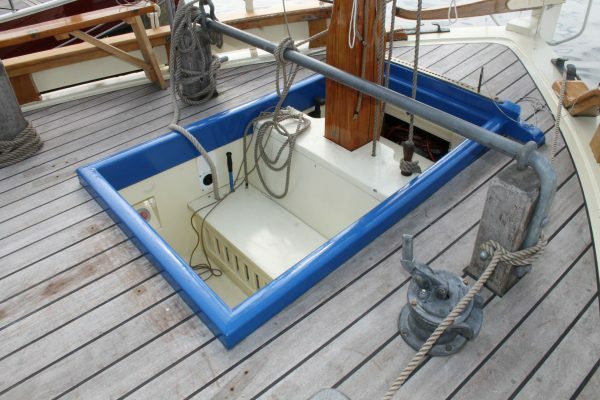 Caulked and payed with butyl rubber. 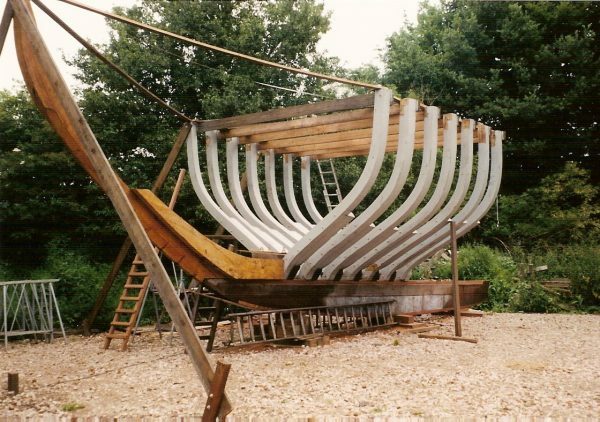 High bulwark all round in the typical Colin Archer fashion, tapering to deck level at either end, mounted on oak stanchions. Coachroof coamings and deck furniture in solid oak. 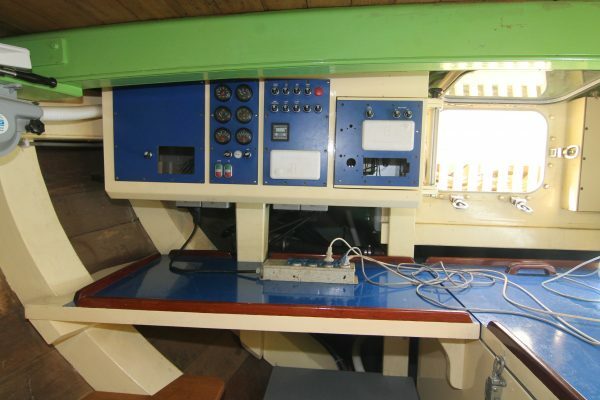 Self draining cockpit well aft with tiller steering on a sternpost hung rudder. 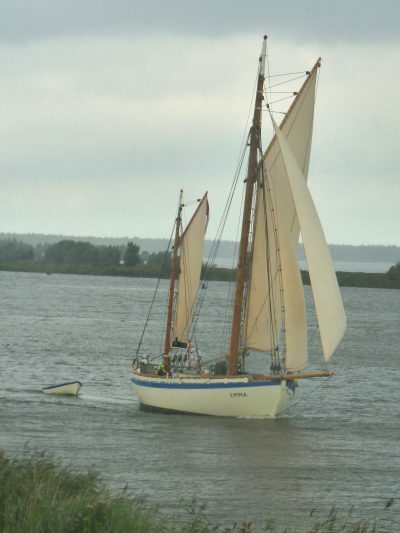 Gaff ketch rig on solid keel stepped wooden masts cut from Larch. 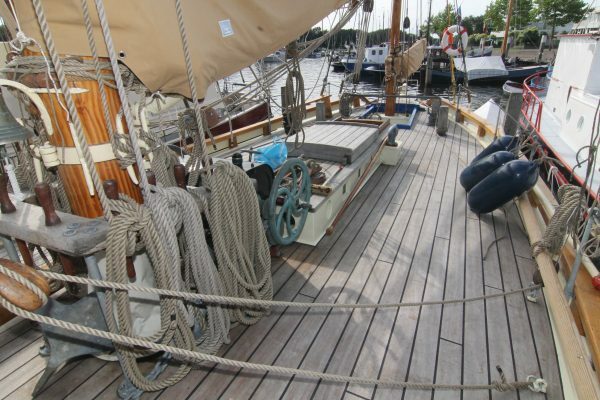 Varnished wooden booms, gaffs and bowsprit. 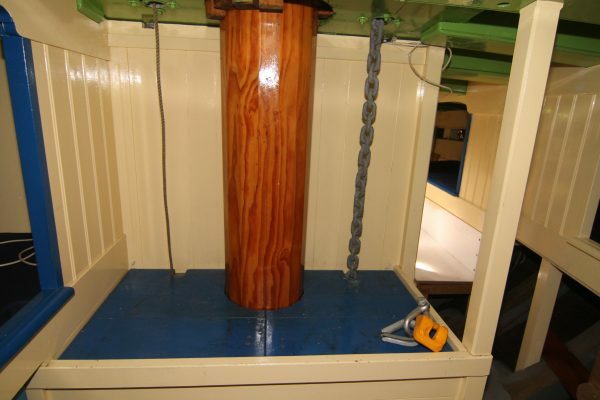 Galvanised wire standing rigging, parcelled and served in the traditional manner. Dead eyes and lanyards to external galvanised chain plates. 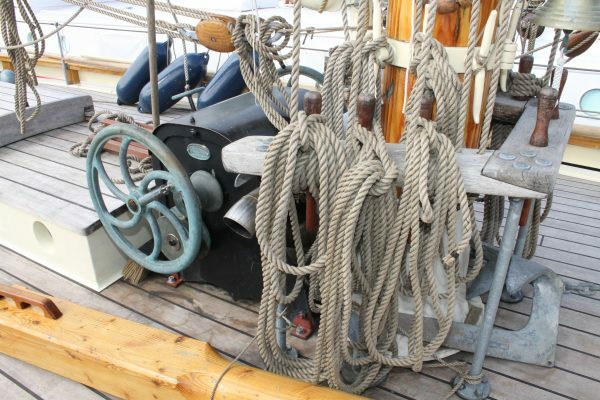 Traditional 3 strand running rigging to a belay pin rail at the base of the main mast. 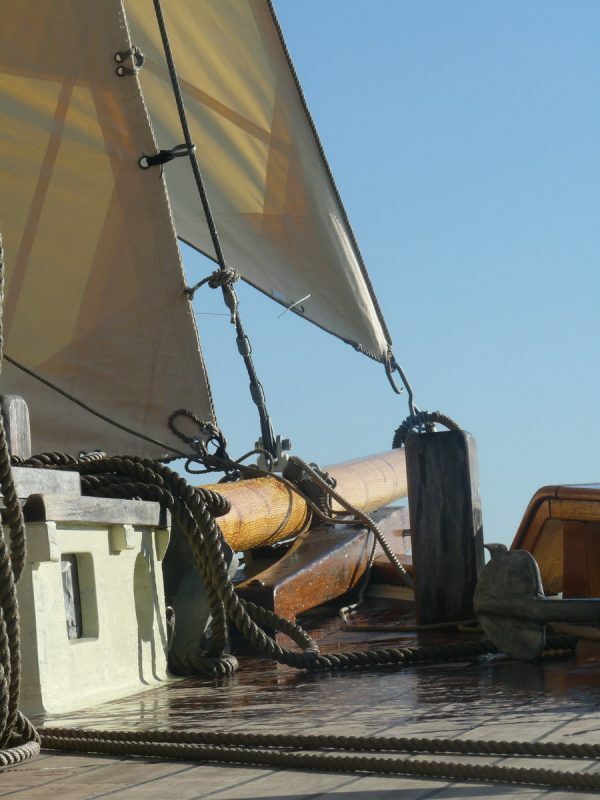 Sails in cream Clipper Canvas, main, mizzen, staysail, 2 x jib and main topsail. 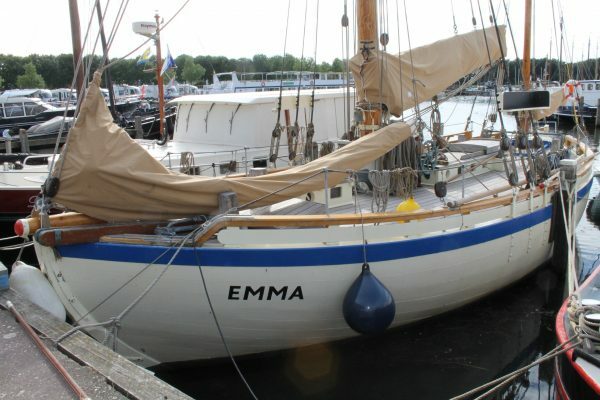 Staysail hanked to forestay, Jib on a traveller. 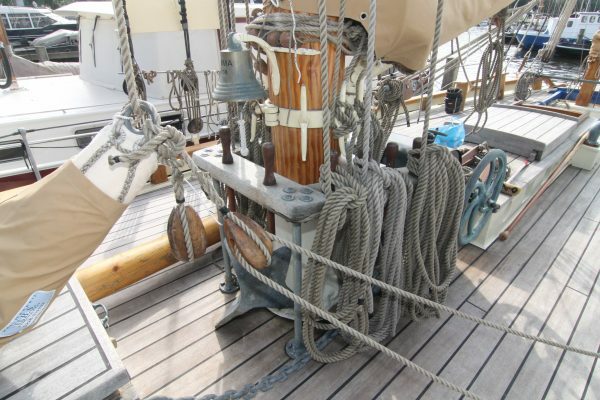 Manual windlass at the base of the main mast with capstan drums to haul the mainsail up. 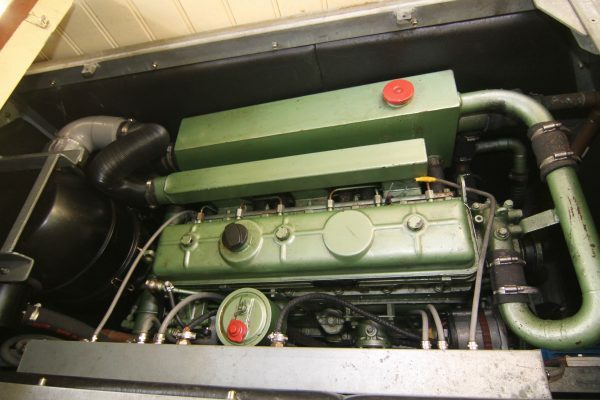 DAF 615 120hp 6cyl diesel with PRM hydraulic gearbox. 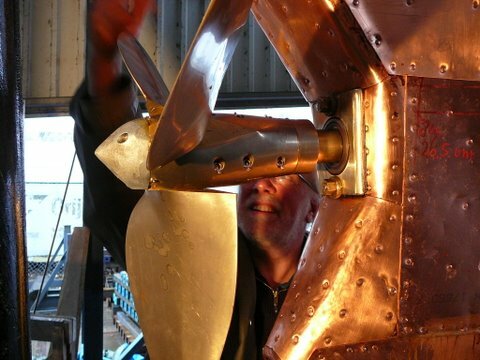 Centreline stainless shaft to a bronze 3 blade furling Max-prop. 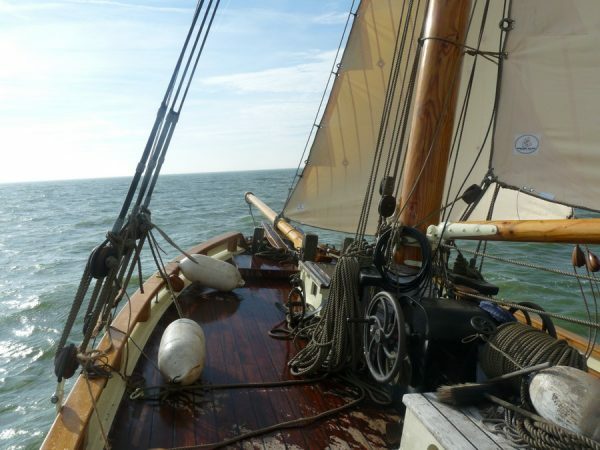 7 knots cruising speed. 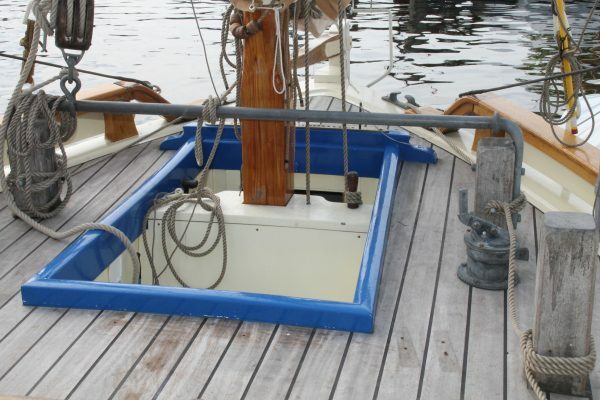 400 litre plastic fuel tank. 600 litres of water in 2 plastic tanks. 4 x 12 volt batteries for domestics and engine starting. 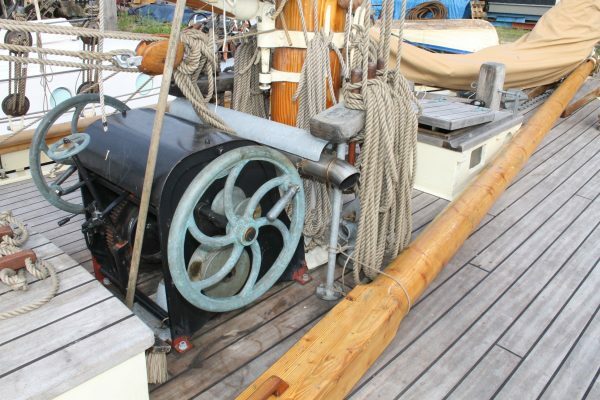 Charged from engine alternator or through installed shore power system with a Victron charger. Victron inverter installed. 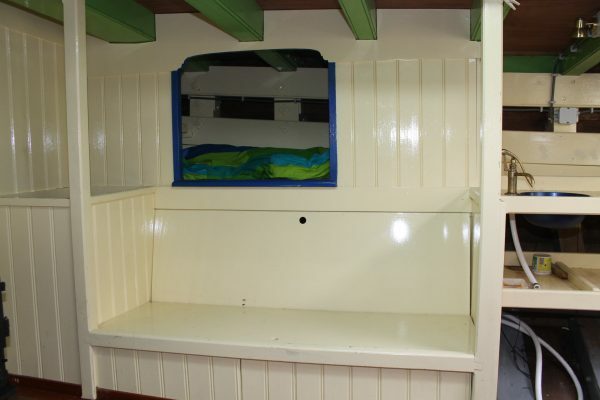 The interior has been fitted out in a basic fashion to give 8 berths in total including a double in the aft quarter cabin. 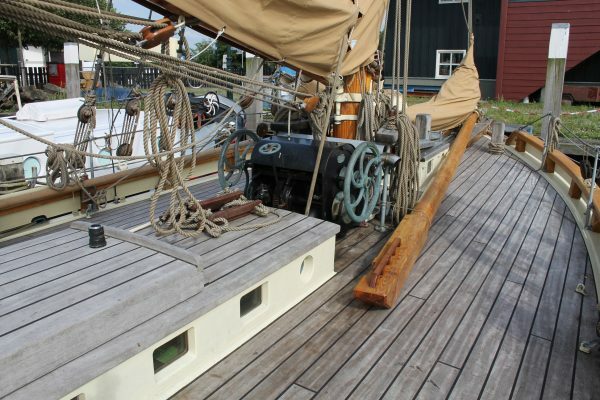 The finish is basic but functional with a lot of space and good sea berths, however it is possible a new owner will want to alter the interior to suit their own specific needs. 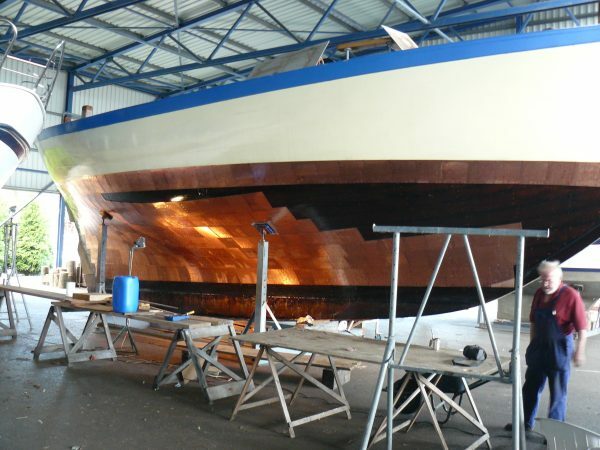 The hull structure is visible throughout most of the boat with very limited panelling allowing great ventilation and easy inspection. 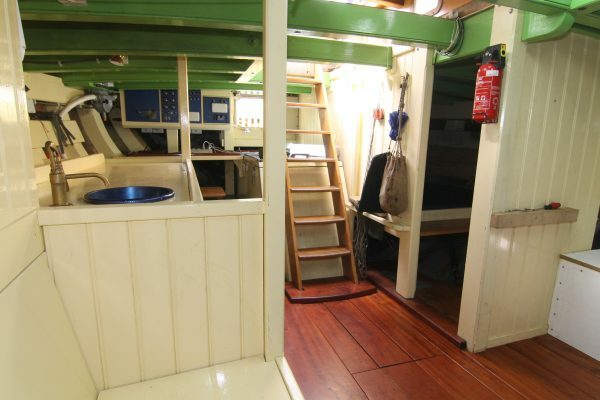 Companion steps down from deck level with a quarter cabin to port containing a double berth. 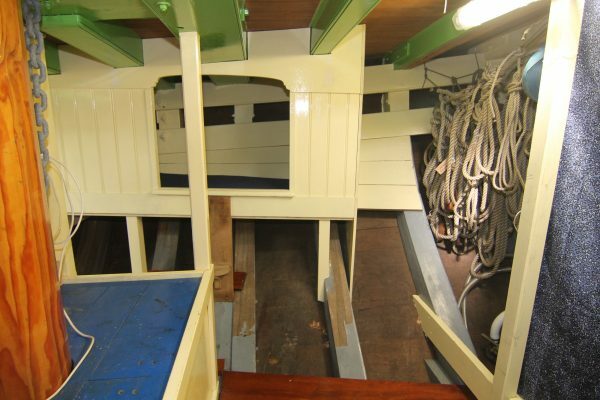 To starboard and further aft is a chart desk, facing aft, and the large engine box below and aft of the companion steps. 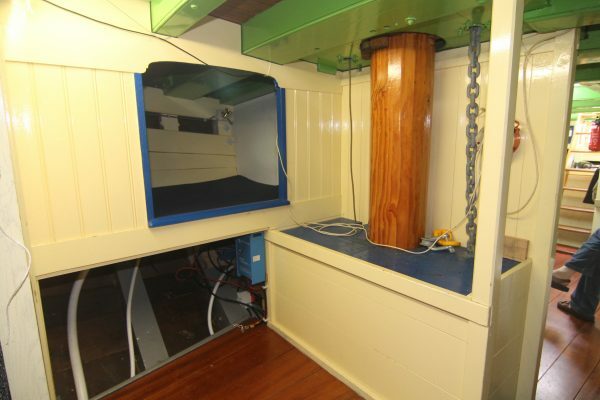 The galley is to port with a long work surface under the deck, a single stainless sink and manually pumped fresh water from a bronze pattern pump. 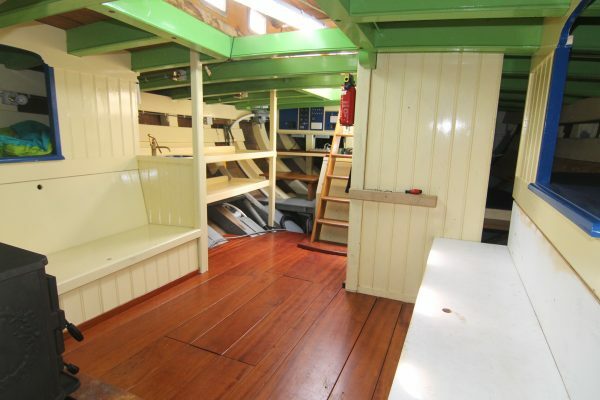 The remainder of the galley still needs to be fitted out to the new owners specification. 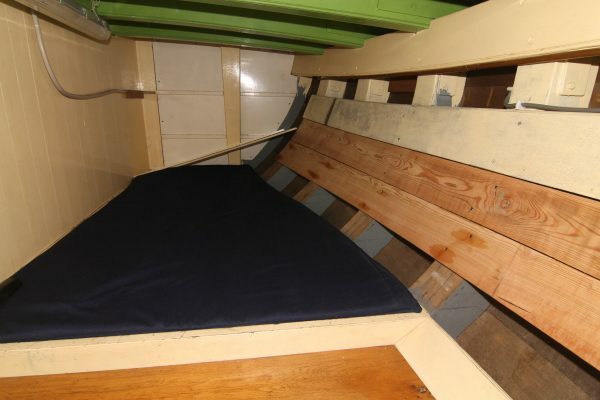 In the main saloon are a settee berth either side and a pilot berth under the deck head behind. 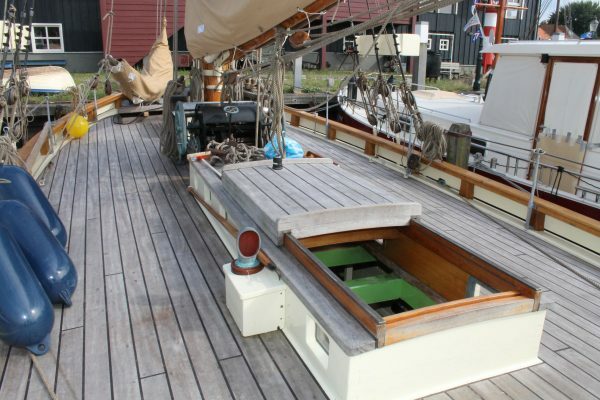 These pilot berths are very secure and private, a clever method of fitting berths into the boat. 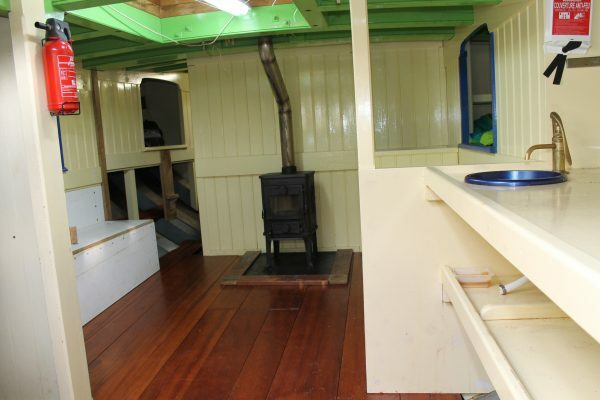 There is a solid fuel wood burner against the forward bulkhead of the saloon. 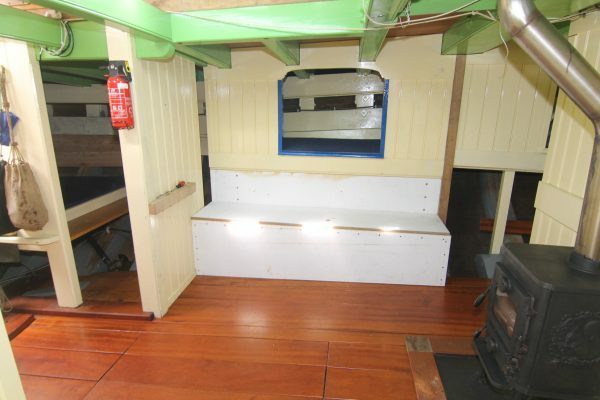 Port side passageway going forward from the saloon with another pilot berth to port under the deck head. 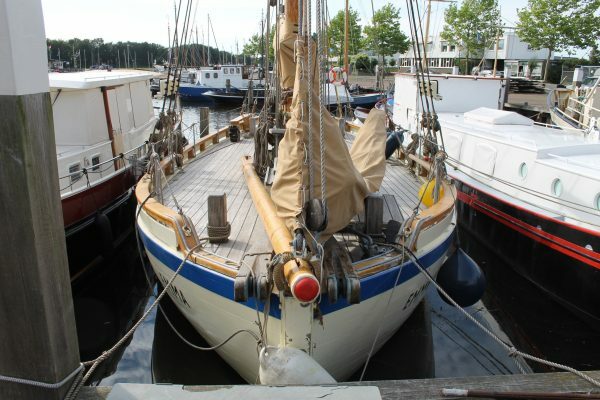 Opposite is a 4th Pilot berth on the starboard side. 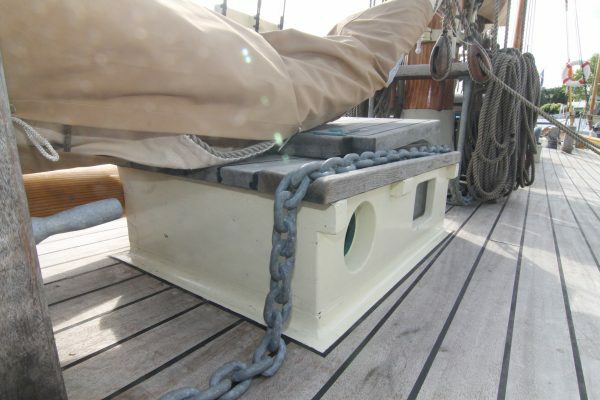 Large space in the part of the boat with a chain locker box at the base of the mainmast. 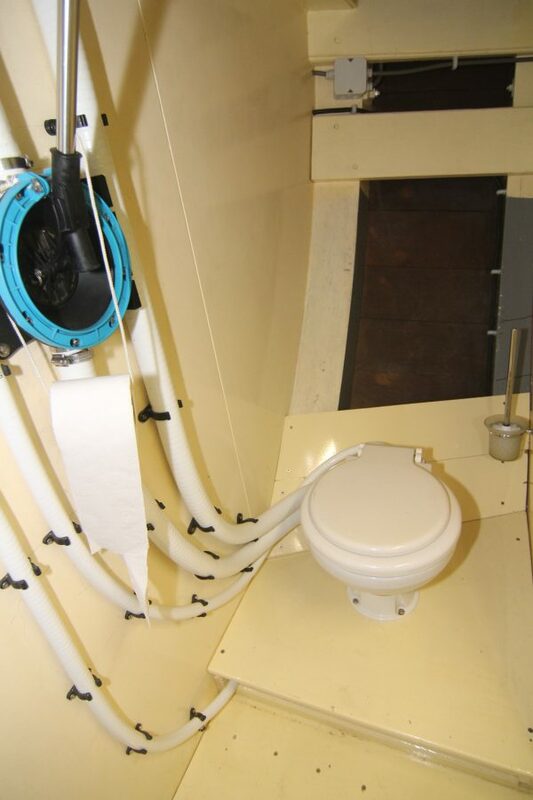 Centreline door going forward into the heads with a Lavac sea toilet discharging directly overboard.